Correct Weight is a dairy heifer monitoring program that measures the growth and performance of heifers from weaning to joining. Combined with strategic animal health and nutritional advice, findings and recommendations are provided in an easy to read one page report after each visit to the farm. Once weaned from milk, many calves struggle to reach their potential. By not achieving their growth targets, milk production, reproduction and longevity in the herd is compromised. Over many years Warrnambool Veterinary have monitored heifer growth rates. Having heifers reaching Target Weights at joining doesn’t happen by chance, it takes planning. Holding heifers in the back paddock or at the out paddock, checking them for water and moving them once a fortnight is a recipe for small, sexually immature heifers. These heifers are a dairy farmers future herd, they need to be given every chance to achieve their genetic potential, staying in the herd for longer producing high volumes of milk and getting back in calf regularly. Pat and Trish Shanahan along with Trevor and Sarah Shanahan of Toolong operate a medium size dairy farm calving from mid-April onwards with a predominantly Friesian herd with some Xbreds. Their calf rearing system is simple, milk twice a day for 2 weeks then once a day with access to calf muesli, straw and fresh water. Once weaned they continue to have access to some supplements and high quality pasture. In late summer of 2014, after discussion with their vet Dr Charlie Blackwood, they recognized their heifers were not reaching suitable joining weights and were entering the herd undersized and not performing how they would expect. Charlie suggested they weigh their heifers initially to see where they were, the heifers were approximately 9 months old. Following this weigh event where the heifers averaged 198kg, Pat and Trevor started feeding a recommended supplement and split calves into two groups, lights and heavies. This allowed the lighter calves a chance to access supplements without being bullied away by the heavier calves which often happens in larger mobs. At the start of their joining program, these 69 heifers had an average weight of 302kg, Target was 342kg. but most importantly, nutritional recommendations. Weights of the heifers can be uploaded to farm software if compatible. In November, when all calves were weaned and on grass, the first weigh and animal health visit occurred. A joining date of 29th July was proposed by Pat and Trevor. Using this date, and a target joining weight for the heifers of 350kg, the average daily growth rate required to achieve this was formulated. The mob was split into 2 groups, “lights” (48% of the mob which were below target weight) and “heavies” (52% of the herd which were above target weight). The 2 groups were offered different diets to lift weight gains quickly, based on what feed, and how Pat and Trev could feed it on farm. In January at their next weigh, 69% were now “heavies” with 31% “light”, average weight gain was 0.89kg/day. At their 3rd weigh event in March, 82% were “heavies “and their average weight gain was 1.02kg/day. They were still being run as two groups, lights and heavies. Both groups have access to minimum pasture and ad lib silage testing 10.2% ME and 11.4% Protein. The light group had been receiving 2kg/day of the custom mix 50/50 wheat canola of approximately 23% protein. The heavy group were receiving 2kg/day of 16.5% protein dairy mix. The ability to draft off and run as a separate mob any heifers that are below Target weight (“lights”) and feed them a higher quality feed with less competition. Discussion with the owner/manager about what feeds are available on farm, and their ability to achieve adequate weight and skeletal growth, in the least cost ration. At the final weigh event at joining (July), Pat & Trevor’s heifer’s average weight was 335kg. This was a great achievement and a huge improvement o the previous season. Electronic data will be uploaded to your herd management software if compatible. The Correct Weight – Premium package is designed to provide both monitoring and preventative herd health treatments for your heifers. For extra peace of mind, let us organise the drenching and vaccinations! 2 drenches of Dectomax injectable at strategic times. 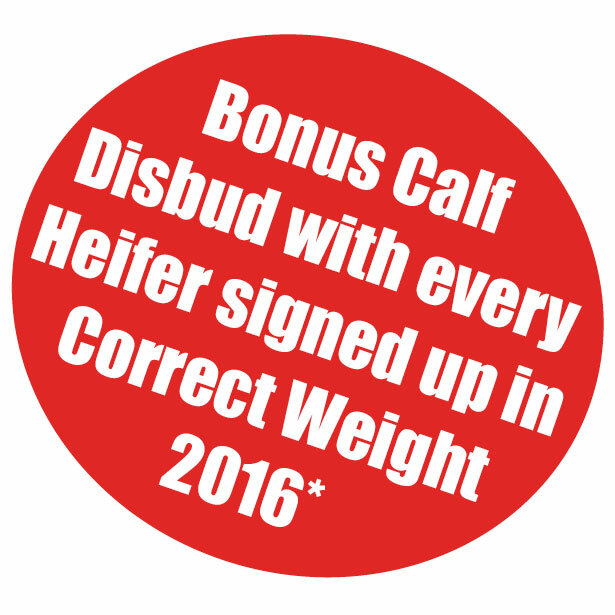 For more information and to take advantage of the Bonus Calf Disbud for every heifer signed up in Correct Weight 2016 contact Phil Keegan or Matt Barnes on 5561 2255. * Standard travel costs apply.